The solar system contains a wide variety of objects besides the familiar planets. These objects range in size, composition and behavior. These objects can also collide with the Earth, with different consequences. The smallest objects produce shooting stars, while the largest can cause catastrophic destruction. These cosmic objects are known as meteors, comets and asteroids. Comets are like dirty snowballs, consisting of rocks, dust and frozen gas. As they near the heat of the sun, the ice on their surface begins to melt. This forms a gas cloud that is stretched by solar winds to form their famous tail. 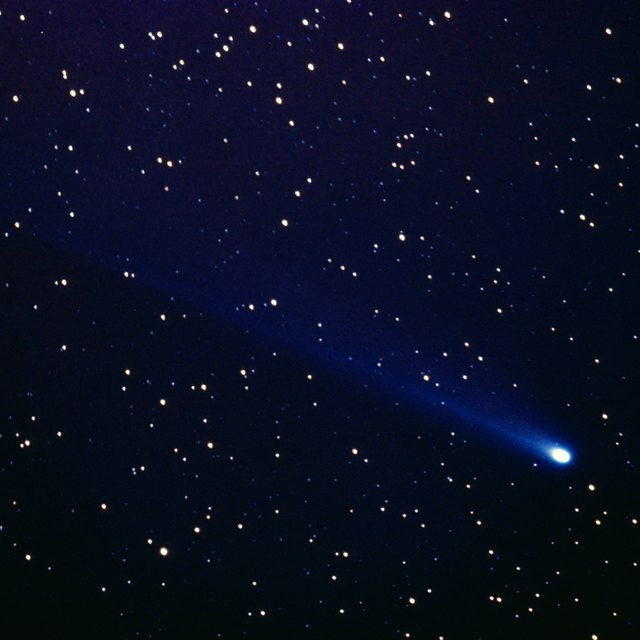 Short-period comets are remnants from the formation of the solar system around 4.6 billion years ago. They originate from a belt of icy objects beyond Neptune, where they were knocked into an orbit closer to the sun. Their solar orbits are typically less than 200 years and are predictable. Long-period comets may originate from a region known as the Oort Cloud, which lies 100,000 times farther from the sun than the Earth does. Their orbits can take as long as 30 million years. Meteors, also known as shooting stars, are small pieces of rock and debris that have entered the Earth’s atmosphere. They strike the atmosphere at high speeds, where friction causes them to burn up. Most meteors are the size of a pea or smaller and completely burn up before reaching the surface. Occasionally, larger meteors strike the surface, and their remains are called meteorites. According to NASA, scientists estimate that between 1,000 and 10,000 tons of meteoritic material enters the atmosphere every day. Asteroids, sometimes referred to as minor planets, are large rocky masses without atmospheres that orbit the sun but are too small to be called planets. There may be millions of asteroids in the main asteroid belt between Mars and Jupiter. Left over from the formation of the solar system, they are formed from different combinations of clay, rock, nickel and iron. They range in size from less than half a mile to nearly 600 miles in diameter. More than 150 have small moons. Jupiter’s gravity, occasionally Mars’ gravity, and interaction with other objects can knock them out of the belt, potentially placing them in the path of Earth. Comet impacts have been theorized by some as the source of both the planet’s water and the building blocks of life. The largest meteorite ever recovered was in southwest Africa, weighing nearly 120,000 lbs. Approximately 65 million years ago, an asteroid produced a crater over 100 miles in diameter in the Yucatan Peninsula, and it has been linked by many scientists to the extinction of the dinosaurs. In the U.S., the Chesapeake Bay is the site of a 56-mile wide crater created by an asteroid around 36 million years ago. According to NASA, there are currently 1,238 known potentially hazardous asteroids (PHAs), which are asteroids larger than 500 feet that will pass within 4.6 million miles of the Earth. Bennett, Doug. "The Characteristics of Comets, Meteors & Asteroids." Sciencing, https://sciencing.com/characteristics-comets-meteors-asteroids-8729823.html. 19 April 2018.